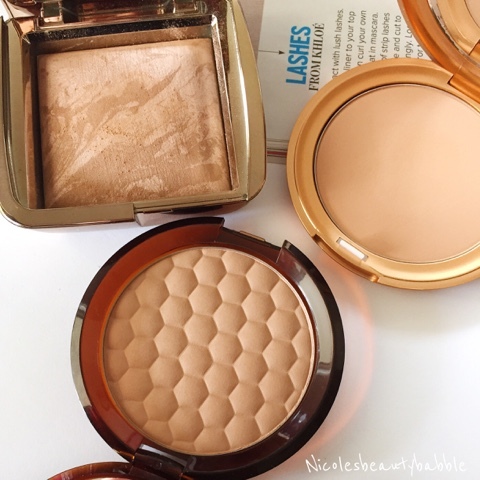 Pictured: Hourglass Luminous Bronze Light, Stila Sun Bronzer & The Body Shop Honey Bronzer. I tend to lean to the lighter bronzer's for obvious reasons me being scared and fair skinned. I also try to find one that does not have a lot of shimmer or glitter in it as I do not particularly want to look like a disco ball. 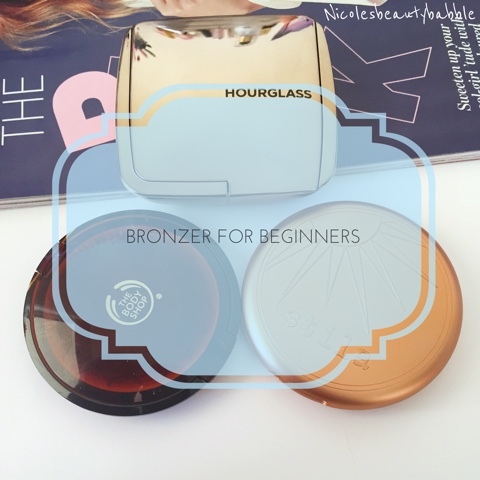 I have really been loving these three bronzer's for my skin and limited experience. I take a little on my brush and using a light hand put a bit under my cheeks, around the temples on my forehead, around my chin and sometimes I just dust the remainder over my nose. I am in no means an expert or a makeup artist and I could be doing this completely wrong but hey I don't care! This is what works for me and what I personally like. I think the best tip I have for anyone starting off using bronzer is to use a little bit and then work it up that's what has worked best for me in getting used to it.Always make sure you tap off the excess as some brushes are just to good at picking up product. Also don't forget to blend everything out so if looks natural. I hope this helps with anyone who may have the same feelings as I did towards bronzer's, they are nothing to be scared of and will change your whole makeup look. I would love to know if you have had the same feelings of being scared to use bronzer as I did or if you have any recommendations for me and my fair skin. Haha I'm definitely still stuck back where you were with bronzer - I'm so pale I'm still scared it's going to make my face look orange but I've heard so much about the Body Shop bronzer in particular and how good that is for fair skins so I suppose if I were ever to give bronzing a go that'd be a pretty foolproof option.